Online shopping continues to outgrow traditional face-to-face transactions, according to latest data from Visa. Its Irish Consumer Spending Index shows a 0.7 per cent year-on-year fall in spending compared to a 3.9 per cent rise in January. The leap day in February 2016 is seen as the primary factor for the decline in annual figures because it added a day’s trading. The Visa index measures expenditure across all payment types including cash, cheques and electronic. It estimates that without last year’s leap day, expenditure would have risen in February 2017 by about 3 per cent year-on-year. Yet this would still have represented a reduction in growth and been one of the weakest rises since the series began in September 2014. The rising tide of online shopping is also continuing. E-commerce was tracking a 7.6 per cent year-on-year growth this month, with face-to-face declining at 5 per cent year-on-year. “This represents the weakest figures for face-to-face spending since the series began in September 2014 and represents the fifth month in a row that expenditure in the category has experienced year-on-year decline,” Visa reported. Spending across the transport and communication category, which includes airlines and car sales and rentals, rose by 5 per cent year on year. Household goods recorded an annual growth of 2.4 per cent. Consumer trade in clothing and footwear has decreased in six of the past seven months. 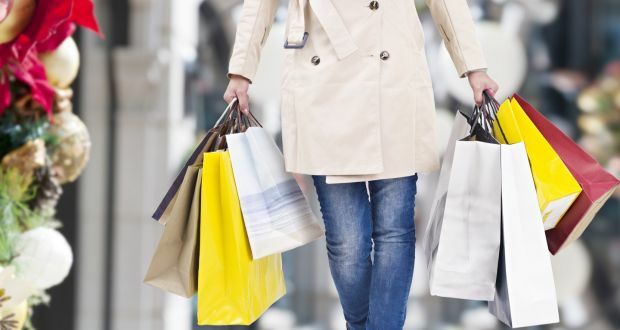 “February marks the fifth month in a row where the increase in consumer spending has registered at less than 5 per cent, underlining the trend that growth is slowing amid a cautious outlook by Irish consumers,” said Philip Konopik, country manager for Visa Ireland.